This awesome Turtles Tattoo Kit contains over 200 highly detailed Teenage Mutant Ninja Turtles temporary tattoo transfers. There are loads of cool images and designs. They are easy to apply and simply to remove…. This toy costs approximately £9.99 (for the latest and best prices make sure you check our retailer list for the Turtles Tattoo Kit above). 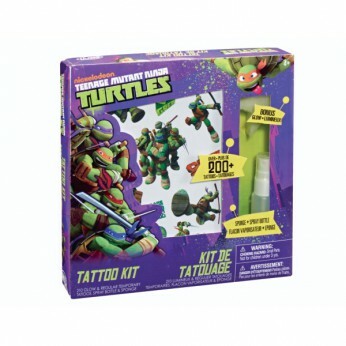 In our review of Turtles Tattoo Kit we classed it as being suitable for ages 4 years, 5 years, 6 years, 7 years, 8 years but recommend you check the manufacturer specific advice before purchasing.